The Wendell Baker Story is a 2005 American comedy film directed by Luke Wilson and Andrew Wilson and starring Luke Wilson, Eva Mendes, Owen Wilson, Eddie Griffin, Kris Kristofferson, Harry Dean Stanton, Seymour Cassel, and Will Ferrell. It premiered at the 2005 South by Southwest Film Festival in Austin, Texas, in March 2005. 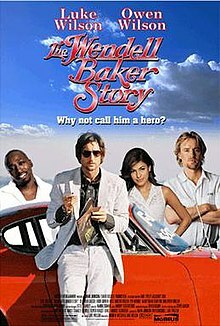 Luke Wilson appears as good-hearted ex-con Wendell Baker working in a retirement home, with Luke's other brother, Owen Wilson, as the home's head nurse. Eva Mendes co-stars as Luke Wilson's character's love-interest, Doreen. Baker, along with three residents of the home, help him win Doreen back; and, Baker helps them fight the corrupt staff. The film also features Eddie Griffin, Kris Kristofferson, Harry Dean Stanton, Seymour Cassel and Will Ferrell. The film was developed through Mobius Entertainment and produced by Mark Johnson of CBS. It was filmed in Austin, Texas and was released on DVD for rental in a number of European countries, and was distributed theatrically by ThinkFilm starting on May 18, 2007. It was released on DVD in the United States on October 30, 2007. ^ "The Wendell Baker Story – Box Office Data". The Numbers. Retrieved 22 November 2011. ^ "The Wendell Baker Story (2007)". Box Office Mojo. Retrieved 22 November 2011. This page was last edited on 26 February 2019, at 22:06 (UTC).